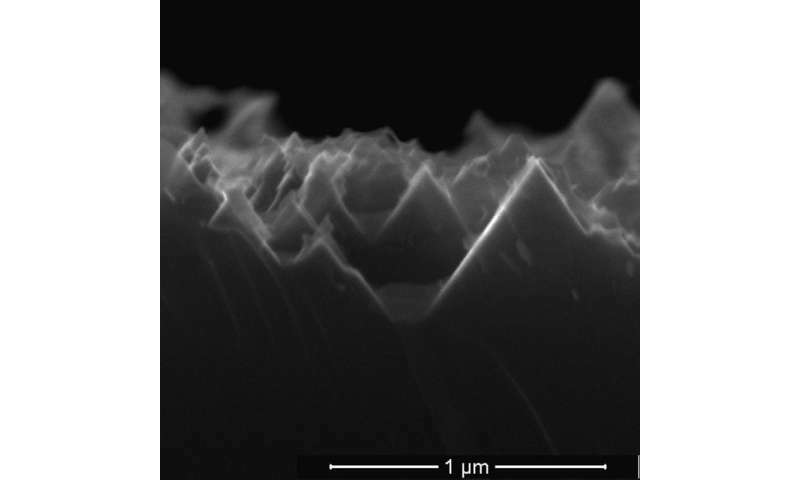 Rice University scientists have found a way to simplify the manufacture of solar cells by using the top electrode as the catalyst that turns plain silicon into valuable black silicon. Barron noted the new work led by Rice postdoctoral researcher Yen-Tien Lu has two major attractions. "One, removing steps from the process is always good," he said. "Two, this is the first time in which metallization is a catalyst for a reaction that occurs several millimeters away." The researchers discovered that etching in a chemical bath takes place a set distance from the lines. That distance, Barron said, appears to be connected to the silicon's semiconducting properties. "Yen-Tien was doing the reaction with gold top contacts, adding silver or gold catalyst and getting these beautiful pictures," he said. "And I said, 'OK, fine. Now let's do it without the catalysts.' 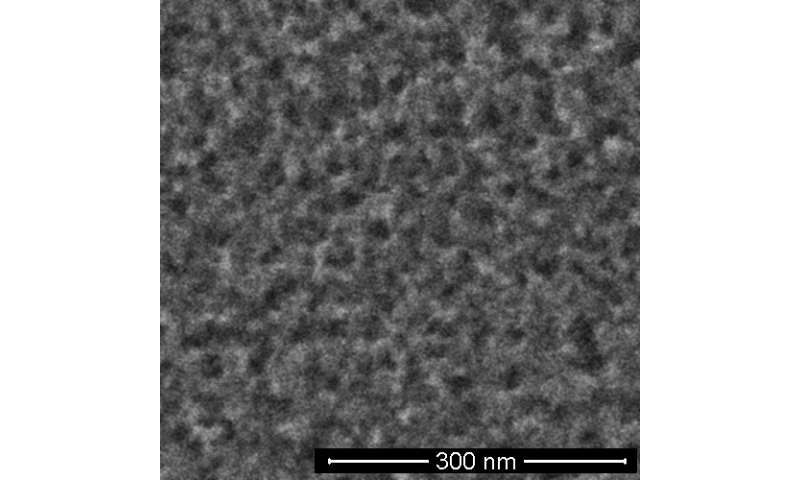 Suddenly, we got black silicon—but it was etching only a certain distance away from the contact. And no matter what we did, there was always that distance. "It told us the electrochemical reaction is occurring at the metal contact and at the silicon that's a certain distance away," Barron said. "The distance is dependent upon the charge-carrying capacity, the conductivity, of the silicon. At some point, the conductivity isn't sufficient for the charge to carry any further." 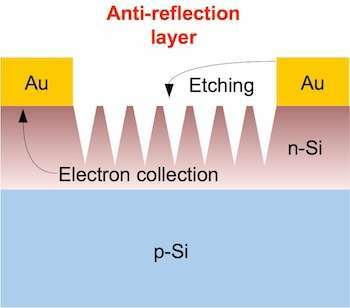 Barron said an extremely thin layer of gold atop titanium, which bonds well with both gold and silicon, should be an effective electrode that also serves for catalysis. "The trick is to etch the valleys deep enough to eliminate the reflection of sunlight while not going so deep that you cause a short circuit in the cell," he said. He said the electrode's ability to act as a catalyst suggests other electronic manufacturing processes may benefit from a bit of shuffling. "Metal contacts are normally put down last," Barron said. "It begs the question for a lot of processes of whether to put the contact down earlier and use it to do the chemistry for the rest of the process." Would a material like black silicon make a better solar sail if it is absorbing rather than reflecting the energy from the photons? No. A black solar sail would provide half the thrust of a (perfectly) reflective solar sail. if the sail however, were completely reflective & to all frequencies of light & did not absorb than this is effectively 'elastic' collision and thus would provide the maximum acceleration to the sail.